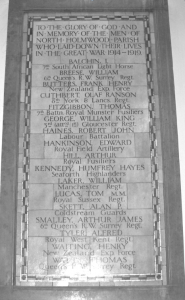 In St John’s Church there is a memorial to those from the North Holmwood area who died in the Great War. When we look at a memorial like this, or hear the names read on Remembrance Sunday, we probably think of young men who spent much of their lives locally, who either enthusiastically volunteered soon after the war started on 4th August 1914, or joined as reluctant conscripts during 1916, and who gave their lives in France. In fact, their background is much more varied. The names on memorials were gathered locally. The normal practice was to make a public announcement through churches and other organisations to ask for names; there was no formal selection. This meant that some of the men included on any memorial might have been brought up locally and have family in the area, but others may possibly have only had a much briefer connection. Using public sources of information it is possible to identify most of the men commemorated in North Holmwood and to discover more of their background. It will be possible to add to this in the future as further records become available on the Internet. I have tried to include only information that I am fairly sure is correct, but sometimes it is difficult to be certain that I have not confused two people with similar names. (It is often easier to trace those with more unusual names.) Many of the British service records from the Great War were destroyed by enemy action in the Second World War, so I have been able to trace much less information for some men than for others. This simply reflects the information available. The information about burials all appears in the Commonwealth War Graves Commission detailed web site. Initially bodies were buried close to where the men died, but after the war smaller burial sites were concentrated into large cemeteries. However, many of the graves could not be identified and these men are commemorated only on the memorials established after the war near the battle areas. I would welcome any additional information and apologise for any mistakes that I have made. Pte. Robert John Haines – 144 Company, Labour Corps. Dorking Museum is indebted to Jim Edwards for his research in producing a booklet for St John’s Church and his generosity in letting us reproduce his work in full.